Meander through Stanmer Park, on the epic hunt for the Earthship, and you may stumble across a collection of strange collection of allotment-like plots. You have found yourself in Stanmer Organics, an organically certified area that is leased from Brighton & Hove City Council by various community groups and organisations. Since 2006, Brighton Permaculture Trust has been involved in developing one of those site, affectionately known as ‘The Plot’. 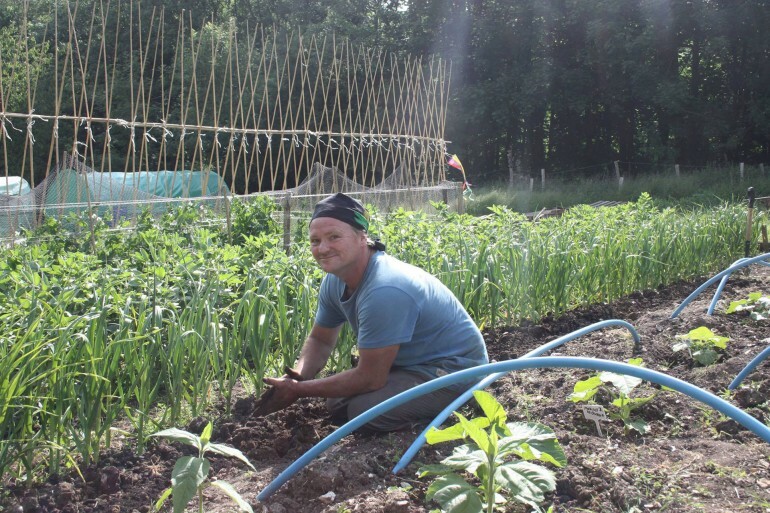 The aim of Brighton Permaculture Trust’s plot at Stanmer Organics was originally to experiment with permaculture in action as well as demonstrating what permaculture is about. During our involvement with the plot, we’ve experimented with different ways to use the site. It has been used to demonstrate techniques like sheet mulching, seed saving, water saving and composting. Brighton Permaculture Trust’s fruit tree passion has also infused the plot. Sussex apple trees have been propagated here, to then be planted out in community gardens all around Sussex. We have been trying out growing trees on their own root stock, as opposed to grafting them. The apple trees have formed the basis of guilds and the beginning of a forest garden. There is a polytunnel on the site as well, which has been used to grow salads and herbs as well as seedlings. We’re always looking for new volunteers to help us at the plot. Currently, Hannah, Vikki, Fran and Sarah are there each Thursday to organise volunteers on a number of tasks, including developing an outdoor classroom. If you’d like to join in, simply to our volunteer mailing list, and we’ll email you as and when new opportunities become available. We’re also looking for donations to help us fund extra materials, tools and plants, will you help us? Our aim is to create a garden which demonstrates permaculture methods in action. We are working toward the area becoming a teaching space. Currently we hold volunteer days each Thursday where people can come to learn about practical permaculture gardening for free. Why support us? Because we are an enthusiastic dedicated team working to educate people on a way of designing that is in tune with nature. We are all volunteers and rely on funding to continue our work. We use funding to buy seeds, plants, trees, tools, compost, fencing and anything we need to continue our development for the site. Our aim is to create an educational site that is low maintenance and abundant in food for generations to come, you can be part of it!